Alcudia is situated in the region called Raiger in the north of the popular Balearic island Mallorca. Although Alcudia is located just opposite the island's capital Palma, you can easily reach Alcudia with a rental car from Palma de Mallorca airport in a short time. And this trip is well worth it, as a visit to Alcudia offers you the opportunity to discover one of the most beautiful areas in Spain. 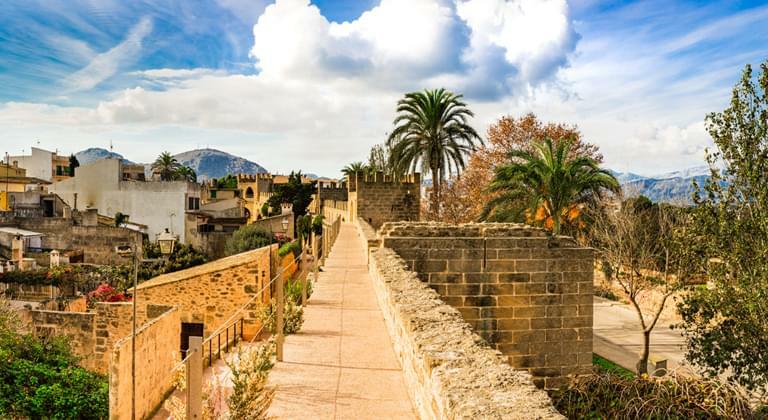 When you book a rental car and drive to Alcudia, a completely new world opens up for you in Spain: The spectacular landmark of Alcudia - the medieval city wall - is already visible from far away. It is very well preserved and offers together with the Porta Dell Moll a beautiful entrance into the historic city center of Alcudia. Here you can stroll through the picturesque old town streets of Alcudia on old paving stones, stroll around the many small boutiques and shops or take a break at a typical Mallorcan café. Alcudia, nestled in an uniquely beautiful landscape, breathes history: the oldest archaeological finds documenting a settlement in the village date back to 2000 BC. Later the Romans founded the settlement of Pollentia here, whose ruins can still be seen today south of the current town wall of Alcudia. During the reign of the Romans, the town even became the capital of Mallorca and the entire Balearic Islands. Even today, the town name still bears witness to the later reign of the Moors: it comes from the Arabic expression "Al-Qudya" meaning "the hill". In and around Alcudia you will always find a cheap car rental service. Check out the offers for car hire online at home and book a car, meeting your needs to discover the Alcudia area and many other highlights throughout Mallorca. Here, beach lovers are spoilt for choice on the spot because of the great offers: Alcudia is located between the bay of Pollensa and the bay of Alcudia, whose beaches are among the most beautiful and longest on Mallorca. Drive along the picturesque coasts of these beautiful seaside resorts with a rental car from a car rental company or park your car and go on a beach hike through the very fine and clean sand. Puerto de Pollensa offers a lot of charm. Next to Palma, the town has the only royal marina in the Balearic Islands and has a beautiful promenade with numerous cafés, restaurants and shops. Puerto de Alcudia is also far from the main tourist areas of Mallorca. At the same time, this is the right place if you are looking for a bit more hustle and bustle and want to discover the nightlife of Alcudia. Check the offers for car hire online and book a cheap rental car that will allow you to explore the environs of Alcudia. If you drive by rental car in the direction of Puerto de Pollensa, you will reach the Formentor peninsula, located directly behind the town. From here, a 13.5-kilometre-long mountain road winds its way to Cap de Formentor, the most northern point of the island. On your way you will be able to take in impressive panoramas of the rugged mountain landscapes of Formentor. It is best to stop on the way there. The Mirador Es Colomer square is best suited for this purpose. From this vantage point a spectacular view opens up to the famous rock formation of Cap de Formentor. With a clear view you will be able to see the neighboring island, called Menorca. On the other hand, if you book a rental car and take the road in Puerto de Pollensa in the direction of Pollensa, the road branches off to the right towards the beautiful little coastal town of Cala San Vicente. In the former fishing village, you can still watch the fishermen repairing the nets. Unlike in Puerto de Pollensa or Puerto de Alcudia, Cala San Vicente offers small bathing bays between towering mountains. The rock panorama visible from these bays is probably the most breathtaking of all Mallorca. Discover the wonderful offers of unique natural landscapes in one of the most beautiful areas. Directly behind the bay of Alcudia lies the "Parque natural de la Albufera de Mallorca" – an about 1600-hectare nature reserve with its marshland and countless bird species. Or continue by rental car in the direction of Can Picafort to Arta and discover the spectacular stalactite caves there - the Cuevas de Arta. Continue along the east coast of Mallorca until you reach the Cuevas del Drach, the dragon caves near Porto Christo. A safari zoo is also close to Sa Coma. It offers fun for the whole family and can even be driven through with a rental car. These are just a few examples of many attractive destinations that can be reached in a short time by car from Alcudia. You are also welcome to enquire about attractive destinations for excursions in a car rental company. Take your rental car on a major island tour on Mallorca. It is not only on the east coast of Mallorca that there is a lot to discover. Especially the northwest coast offeres something unique for the whole of Spain. This is where the fascinating mountain scenery of the Sierra de Tramuntana stretches from the Cap de Formentor in the north to Andratx, just south of Palma. Here you can drive along endless winding mountain roads and discover many picturesque places with beautiful bays. Drive by rental car via Puerto Pollensa to Pollensa and discover one of the most beautiful small towns of Mallorca with its picturesque market square, where you can buy fruit and vegetables every Sunday. Continue to Soller, which is no less beautiful. From there you can take the historic wooden railway to Palma. The reception building of this historic train known as the "Orange Express" is considered to be the oldest in the world. From there you can also take a historic tram to the beautiful harbour town of Puerto de Soller. From Soller, this mountain road, which is uniquely beautiful even for Spain, leads on to the famous little artists' village of Deia and to the idyllic mountain villages of Orient or Valdemossa. The offers of excursion destinations are practically inexhaustible. From Valldemossa you can travel to Palma, the capital of Mallorca, by car in no time and without which no visit to the island is complete. This lures with a variety of different offers: Whether you are looking for culinary delights, first-class shopping or typical Spanish culture, Palma has something for everyone to discover. Right by the sea there is the palm-fringed Paseo Maritimo and the large royal marina. From here you can also see the famous Cathedral of La Seu, which is the most important landmark of the city. Directly in front of the cathedral is a multi-story car park in which you can park your rental car and then explore the city by foot. Palma City is the capital of Mallorca and the whole Balearic Islands. The city offers a wide variety of attractions. Palma offers a metropolitan flair and enchants with its mix of large, prestigious boulevards and lively little streets where you can discover small shops and galleries. If you book a rental car, you can get to Palma quickly and cheaply for a day trip from Alcudia to Palma and back. Alcudia is one of the largest cities in Mallorca with more than 19,000 inhabitants. Whoever comes here with a rental car will not be disappointed. The old town has no shortage of sights. These include the Església de Sant Jaume and the Oratori de Santa Anna. The Cova de Sant Marti (St. Marti Cave) is also interesting. The natural cave was used as a secret place of worship during the early Christian period. But even apart from the church buildings, the old town of Alcudia attracts visitors with its Mediterranean charm. In cozy cafés and narrow alleys, you can enjoy the city. During the warm summer nights, Alcudia even offers live music in the restaurants and bars.